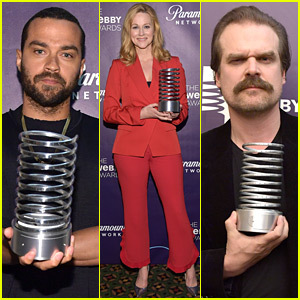 Jesse Williams, Laura Linney, and David Harbour show off their trophies backstage at the 2018 Webby Awards held at Cipriani Wall Street on Monday (May 14) in New York City. Jesse won the Webby Special Achievement Award, which was present by Swizz Beatz. Laura won Webby Best Actress which was presented to her by Liam Neeson. David picked up Webby Best Actor and FKA twigs also received a Webby Special Achievement Award. Adam Sandler picked up a Webby Special Achievement Award, presented to him by Steve Buscemi, and Steven Soderbergh was awarded the Webby Film & Video Person of the Year. The March for Our Lives won the Webby Special Moment Award and young activists Cameron Kasky and Naomi Wadler accepted the award. FYI: FKA is wearing Monika Chiang shoes. 11-Year-Old Activist Naomi Wadler Dishes About Her Phone Call from George Clooney on 'Ellen'! 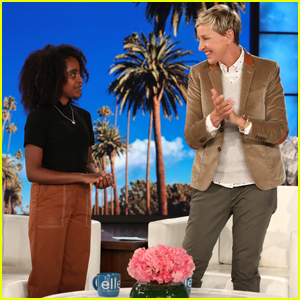 Ellen welcomes 11-year-old activist Naomi Wadler to speak about the March for Our Lives rally that took place on March 24 on The Ellen DeGeneres Show, airing on Wednesday (April 3)! In her first sit-down interview since the rally, the fifth-grader shares she was nervous before her speech, but the encouragement from the crowd calmed her down.